1 case/25 cups. Quantity shown below is for 1 case. Our 5 Panel Drug Test is curated as a cost-effective and dependable method to detect the presence of drugs. Our 5 Panel Urine Drug Test is a CLIA waived and FDA approved POC (Point-of-Care) urinalysis cup. Our affordable 5-panel Drug Test sells for an astonishing price of $2.50 per cup order of 100 cups. You can also order in bulk to avail our special prices. Our 5 Panel Drug Test comes in a round design with a drip and leak resistant lid along with a peel-and-read label. Each of our 5 Panel Drug Test comprises of a pre-built temperature strip that authenticates the donor’s urine specimen so you can be certain about the accuracy of our test results. This urine drug test complies with SAMHSA cutoff levels and is extremely sensitive towards minor amounts of drugs present in the urine. The latest cut-offs make this the ideal urine analysis test for addiction screening and pain management at your workplace. Our 5 Panel Urine Drug Test is a fully integrated and self-reliant test that offers 99% accuracy so you do not need any assistance. It is ideal for home drug testing as well as work related testing. Our 5 Panel Drug Test provides instant results in just two minutes or even less. Although, we recommend that you wait for 5 minutes after the drug test has been taken. Do not wait for more than 8 minutes to assess the results. Always store the drug testing cup at optimal temperature- between 36 degrees and 78 Degrees Fahrenheit. After removing the seals, use the drug testing cups immediately. 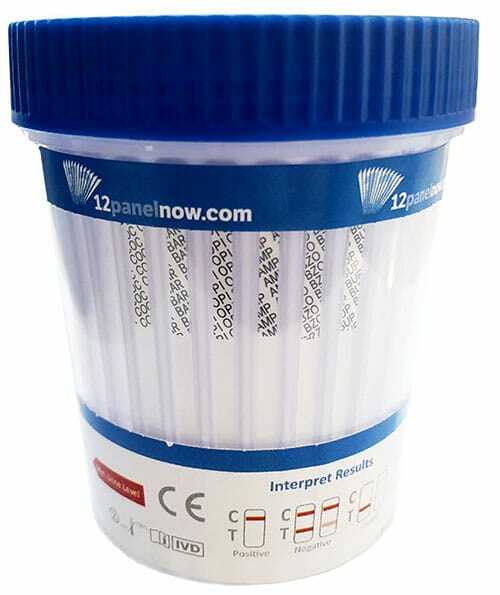 Lower down the temperature of 5 Panel Drug Test cup and specimen from the refrigerated temperature to room temperature before using. Use the 5 Panel Drug Test cup as soon as it is removed from the sealed pouch. Ensure that donor mentions the date and initials on the body label. Have the donor secure the lid tightly after providing the urine specimen in the drug testing cup. Check the screw for tightness and start the timer immediately. The accurate range for a doped specimen is 90-100 degree F (32-38 degree C). The results of the test are indicated by the presence or absence of colored band(s) in the result area of the test strips. Read the results after 5 minutes. Do not wait for more than 8 minutes to read the results. Confirm the positive test results by another drug testing method. Send the five-panel drug test cup and urine specimen intact to a toxicology laboratory for authentication.